Commemorative stamp of Paraguay featuring a side of 1952 or 1953. 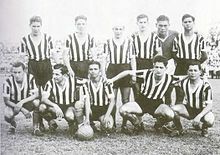 Alarcón is third from left in the front row. Club Libertad is a football club based in Asunción, Paraguay. It was founded in 1905 and plays in the Paraguayan Primera División. ^ "Club Libertad: Summary". Soccerway. Perform. Retrieved 23 June 2016. ^ "Medida y capacidad de las canchas". APF. 13 July 2018. ^ "Club Libertad: Trophies". Soccerway. Perform. Retrieved 23 June 2016. ^ "Sin títulos pero con promocionados, Javier Torrente presenta renuncia en Libertad" (in Spanish). Ultima Hora. 31 March 2010. Retrieved 2 September 2013. ^ "Gregorio Pérez dejará Libertad". ABC Color (in Spanish). 29 May 2011. Retrieved 18 January 2013. ^ a b "Rubén Israel regresa a Libertad". La Nacion (in Spanish). Grupo Nación de Comunicaciones. 11 July 2012. Archived from the original on 14 July 2012. Retrieved 18 November 2012. ^ "Jorge Burruchaga es nuevo técnico de Libertad". Ultima Hora (in Spanish). Editorial El Pais. 25 June 2011. Retrieved 18 November 2012. ^ a b c "Pedro Sarabia es nuevo entrenador de Libertad" (in Spanish). Paraguay.com. 2 September 2013. Retrieved 18 January 2014. This article about sports in Paraguay is a stub. You can help Wikipedia by expanding it.